These iPad floor stands offer lots of options for helping a person keep up with the million ways to use their hand held tablet. While some non-locking residential models are offered in fixed-heights, non-fixed models are available as well. Buying adjustable iPad floor stands, also known as touchscreen tablet holders, is like getting a bunch of different units all in one! In addition to a vast array of physical styles for matching décor and usage needs, these technology enclosures can also incorporate several different styles of cases, covers, and mounts for the devices themselves. 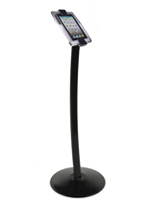 These non-locking iPad floor stands, also known as residential tablet kiosks, are suitable for personal use, as well as business or professional operations. Depending on the specific model, these touchscreen holders are height adjustable from 25" to 59". 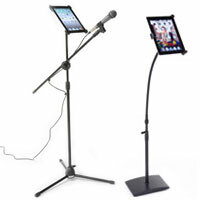 Versatile Apple® iPad floor stands are suitable for use at home, work, or school. What are some of the different tablet holder configurations available? 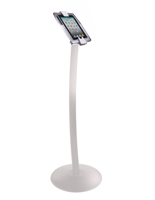 iPad Floor Stands w/ Pedestal: Podium styles can be either fixed or adjustable height. Meant for users who are standing, they can be as simple as a narrow unadorned metal column or as ornate as a carved wooden lectern-style unit incorporating storage space for accessories and covers. Residential non-locking pedestal kiosks can be used as permanent fixtures in the home or office, or they can be portable, easy to assemble/disassemble styles. Touchscreen Mounts w/ Rigid Neck or Pole: Technically a sub-set of pedestal models, this construction type generally comes with adjustable height capabilities. 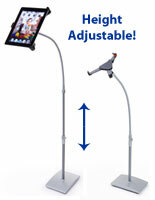 Tablet Holders w/ Gooseneck: Named for the long, flexible necks that geese have, these styles offer nearly unlimited adjustability for optimal visibility when standing. Technology Displays w/ Pad or Tray Enclosure: These setups each have a full-size backer that the tablet rests upon, while in other cases the devices are fixed inside the tray or frame with screws or brackets to secure the display. Some of these styles are similar to lecterns, with a lip on the enclosure that keeps the device from sliding. Electronic Displays w/ Case or Cover Mount: These frames can house tablet devices so that only the edges of the device are gripped, while in deeper models, devices are protected from users accessing unauthorized buttons or menu commands. Tablet Displays w/ Bracket: These accessories "cradle" the tablet within, and can reach around different sides of the device enclosed, or fasten to the corners. Touchscreen Holders w/ Solid Base: Solid base style floor stands are wider than the enclosure, with metal, plastic, glass, or stone, for stability and style. Technology Enclosures w/ Tripod Base: Although there are many styles of home tripod bases on the market, they are all distinguished by having three feet or legs of fixed, or adjustable, length. These non-locking residential mounts designed for Apple® have tons of features to recommend them for home, retail, or office use. With flexible gooseneck styles, comfortable viewing is easy whether checking a shopping list, editing a budget, giving a presentation, watching a movie, or playing sheet music. Hands-free reading or studying is possible with these tablet stands that are placed at eye level. These accessories are great to use as recipe stands in kitchens with limited counter space, or for directories in a hotel lobby. In stores, these touchscreen stands can be used to gather customer information or advertise wares. Viewing options are endless!